A Is For Algorithm: Bubbles! 1. Buy this book, which has tons of information on making the biggest bubbles in the world. It comes with a patented "Bubble Thing" which is absolutely necessary. 2. Buy the ingredients for making the bubble juice recipe in the book. Most of the ingredients are easy to come by (distilled water, Joy dish washing liquid, corn starch, baking powder). But make sure that you also splurge and buy glycerin. I bought a 16 ounce bottle from Amazon. 3. Clean two big five-gallon buckets. Multiply the bubble recipe to make six gallons of the bubble juice, putting three gallons worth in each of the buckets. 4. The Bubble Thing is awesome, but you probably don't want more than one of them, and it's a little hard for young kids to use, so make/buy other bubble wands. We had some normal plastic wands. We also bent a dozen wire coat hangers into circles. Paper towel tubes work surprisingly well, too, but they do disintegrate after a while, so make sure to have lots of them. Colanders are a ton of fun, too. 5. For the party, put the two buckets at opposite ends of the yard. Put all the wands in a third bucket in the middle. Lay out a pile of towels, for people to wipe their hands. We also put out some lawn chairs, but most people wanted to be in the middle of the action. 6. That's it! I had food and drinks in the house, but we started blowing bubbles on the front lawn as people arrived, so the food was completely untouched for at least an hour because everybody wanted to be near the bubbles. It was awesome. Awesome! 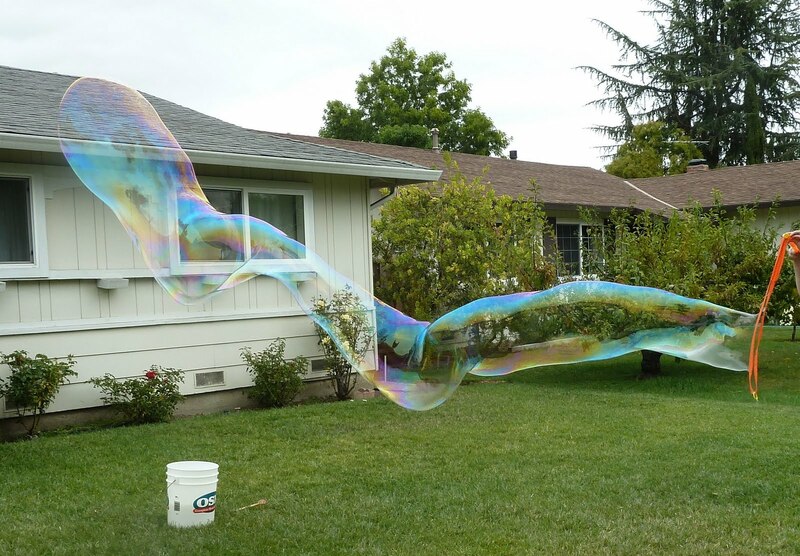 The big Bubble Thing was used mainly by the adults, and made bubbles up to twelve feet long or so. But even the three-year-olds were able to produce some bubbles with it, though smaller, and the bubbles stayed attached to the wand. Two-year-olds were able to handle the coat hangers very well, which made bubbles more than one foot in diameter and 2-3 feet long. I read that bubbles this big could be produced with this particular wand and bubble solution, but I didn't really believe it until I saw it in my own yard. Thus, I feel compelled to show a few photos (with people cropped out of them, to keep my thin veil of fake anonymity). Awesome, right? You could fit multiple children in each of those bubbles. Those bubbles were big enough that neighbors more than a block away were standing in their own yards exclaiming over them. And the kids had a blast experimenting with different ways of making bubbles and chasing them down in the yard. You know you want to go and do this yourself. Best party ever! That looks pretty awesome. We might have to do this soon. Not for Elizabeth's birthday, it's in December and probably too cold, and I am not sure I can wait that long.